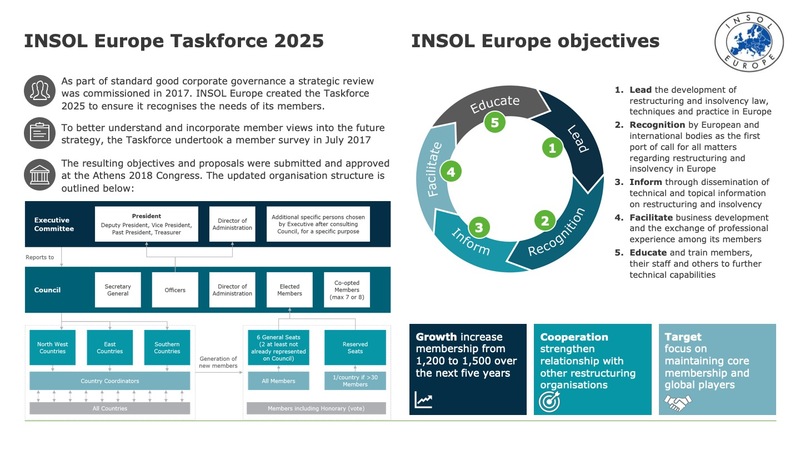 Last year, the Council of INSOL Europe decided to initiate the formulation of our organisation's strategy for the years to come. To this effect, the Strategic Task Force 2025 was established, which comprises eight members of INSOL Europe, mirroring its extensive professional and geographic diversity, led by Messrs Dr. Steffen Koch and Wolf Waschkuhn. As for any strategy, the starting point is of key importance. The Strategic Task Force developed a questionnaire to elicit the many opinions of the current membership, your motivation and aspirations and how INSOL Europe should be seen in and seen to interact with the outside world. The questionnaire was completed in 2017 and the results have been analysed in detail and used in the development of the strategy. A summary of the areas of strategic focus is presented below and can be download as a PowerPoint presentation here.